You can share most pages on the website with your friends. Just click on "share icons" on the right under the register box. Say hello to our site mascots. We couldn't have made this site without the enormous help and dedication from the "Great Canadian Joke Book" family of Mascots. You might want to adopt a Mascot yourself. Stay tooned, because soon they will be offered on T-shirts and posters. We found Corny hitch hiking from his old home in a cornfield after he noticed some strange looking new neighbours had moved in. He told us he tried making friends with them but they had a "glazed and zombie" look and he realized they were - alien corn cobs. YEEKS! Naturally, Corny being so smart, he ran away from home. Now he is our "Text Jokes" Manager and he will be reporting from time to time on what is going on in the vegetable world. Nice to have you aboard Corny. 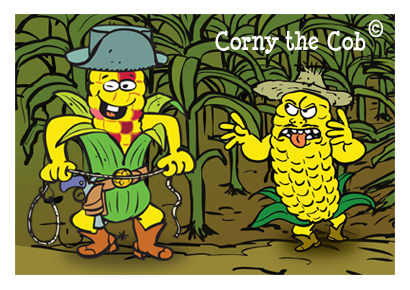 Our friend, Corny the Cob, is actually more of a "country bumpkin" than a big city fella and this is by choice! Corny believes that the farther he stays away from movie theatres and Orvil Redenbacher conventions, the safer he will be. Fritz is one of the cuddliest and most friendly mascots we have. 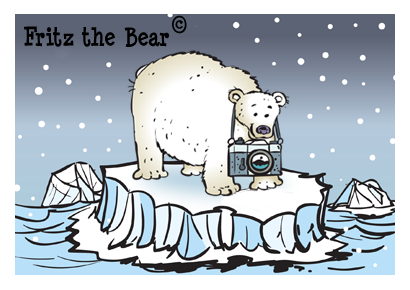 Fritz was losing his home on the northern Canadian ice shelf due to "global climate change". We immediately saved him and gave him a new home in a cool beautiful Canadian condo in a secret location. Fritz likes reading magazines, drinking beer and eating fish. He is our official mascot of all our "Crazy Photos" which you can see in our View Jokes and Submit Jokes sections. He also is a star in the Arctic cartoon, sun bathing under a new "climate change sun." Fritz the Bear, or "Fritzie" as his friends call him, has finally made it into show business. Please drop in and visit him, just don't tell him any "bear skin" rug jokes, for some reason he's kinda sensitive to those. Where do you find a good Jester these days? 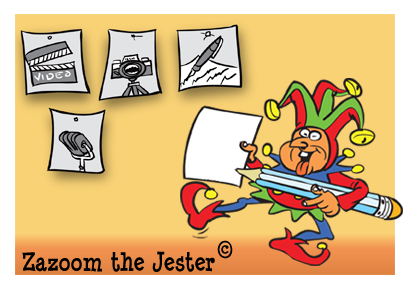 Zazoom the Jester has always been a "class clown"... actually, he has "no class" and is mostly a "clown". Recently Zazoom was fired from a King's palace for being "too funny" and keeping the King and Queen up all night laughing. So now Zazoom has found a new home right here as our official mascot in charge of "Cartoons". 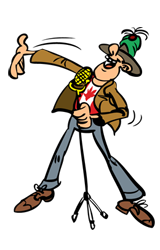 Zazoom also introduces our large "Cartoon Canada" cartoons recently escaping major injury while driving the Great Canadian Jokemobile without a licence! If you are an Artist or Cartoonist and would like Zazoom to review your great cartoons, become a free member today and submit your work for all to enjoy. When you think of cartoons, think of Zaz... He is the "king of all things kar - and - toon". With over 1400 years of experience, starting with King Arthur, Zazoom has won the award for being the world's oldest living and working Jester. Mighty fine work Zazoom! Special Ed is our Stand-Up Comic and MC. Ed was thinking one time of joining the Canadian RCMP, (Royal Canadian Mounted Police). He just loved riding horses and figured, why not become a "Mountie" and "get yer very own horse." Ed already wears his regular Mountie hat, and his second sporty "Mountie turban hat" too. He even has own little practice horse called "Leaky" who when excited does, leak a little bit. You will be able to see Special Ed in many locations on the site, one as "Master Of Ceremonies" on the home page, or auditioning "New Comics", and introducing Voice Jokes. Ed loves to work a crowd. 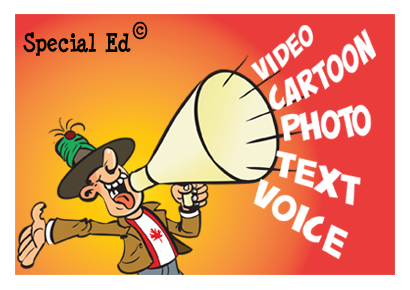 Ed's trademark is using a megaphone as his favourite method to gather a crowd, ever since he sold papers at the corner of Yonge and Front streets in Toronto. But, lately, Ed has been using Twitter ... which he thinks is a bird. We love you Ed... that goes for "Leaky" too!! 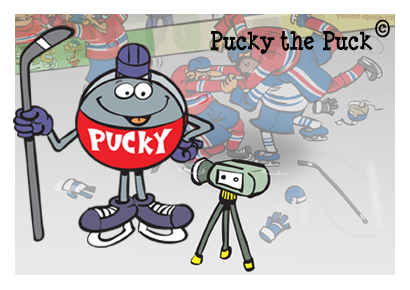 What would Canada be without Pucky the Puck? Our great mascot, Pucky the Puck, was donated to the "Great Canadian Joke Book" by some great kids, who had just finished a hockey game and asked us if we could give Pucky a good home. We said YES! Now Pucky attends all of our hockey games. We put him in charge of our website "View and Submit" comedy videos. He lives in his very own "hockey net", you can always tell when he is home because his "red light" is on! Pucky would love to be friends with all our Members, so don't forget to say hello and he will give you a big Yeah! We want you to send Pucky your funniest videos so the rest of our members can enjoy your sense of humour. Who knows... you might even win one of our regular contests! But now, as Pucky says, "it's time to get the puck outta here!" You know Moose's (meese?) are hard to find unless they want to find you. Okay, here's the real story. 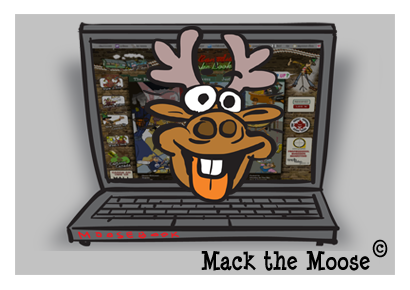 Mac the Moose thought he was a bear because one of his parents was a bear. When Mac was first able to walk he would smell a fire and think - "FIRE!" then find the fire and leak all over it. While living in a lovely area of Algonquin Park, he stumbled into a "geek" type Woodsman called, what else Woody the Web Designer. Woody saw Mac and took a photo of him. Mac loved the photo and being a smart and magical Moose, the two became the best of friends. Soon Mac was writing code. Woody just had to take Mac home because good code writers are so hard to find around these parts. Pete is a genuine Parrot all the way from Australia. He hitched a ride on a freighter going to Canada and kept the sailors laughing with mimics, jokes and the odd "Thar she Blows" when he saw a whale off the front bow. He reached Vancouver and did some "perch-up" comedy in some hang-outs in Stanley Park. Naturally smart and talkative, we hired Pete to appear in the "Great Canadian Joke Book" as a greeter in the "Profile Pages" of the web site. He also offers answers to questions you might have, especially if he doesn't know the true answer. This work does not interfere with his weekly "perch-up" comedy he does at "Bird Brains" a local comedy club for hilarious birds. Even though Pete can be a bit "repetitive" sometimes, a bit "repetitive" sometimes, "repetitive" sometimes... he still likes nothing more than giving away great prizes to our winning members. 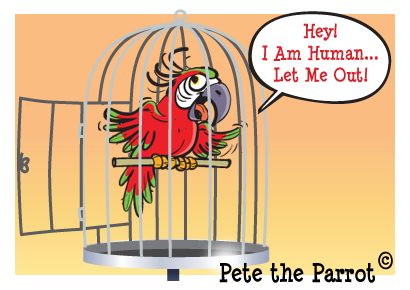 So, remember that it pays to be nice to Pete the Parrot. Did you ever think of what name cows call Canada? Well now you know it's, "Cowanada". 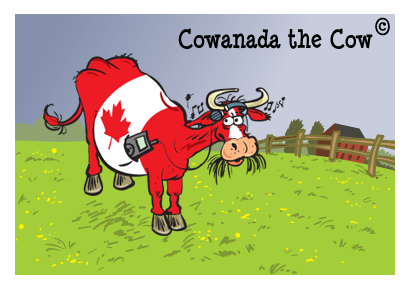 Our Cowanada mascot is our newest Canadian Cowanada mascot. He loves to hang out and listen to tunes on his CowPad too. He was once a big time "Country and Western star in Cow Calgary... one them "real western towns", in Alberta, Canada. If he wears a Cowboy hat he looks so much like country star Ian Tyson, people have to look twice! He was a big hit years ago in a television show with a "Stompin' Tom Connors" performance of a Newfie song when he sang, all the Moo parts in perfect "pitch - fork" ~~~ Moo Moo! Now listen up folks. We hope you'll like all our Mascots because soon we will be offering them to you in Posters and tee-shirts shortly. If you are interested in a mascot drop us a note under "suggestions" in the link bar and let us know your favourites. Stay tooned because we are only just getting started. The Great Canadian Joke Book Management Team welcomes you all.